In this lesson, we will investigate some fundamental open chord shapes and applications. Open chords or chords that contain open strings are a great place to start when learning standard tuning or an altered tuning such as DADGAD tuning . Although you likely know many open chords in standard tuning, the way you fret them in DADGAD tuning is different. Open chords also sound different in DADGAD and have a rich ringing quality which is one of the defining characteristics of this wonderful tuning. DADGAD tuning specifically favours chords built around the note of D, so you will notice throughout this lesson that the chords, scales, and pieces are often in D major or D minor. As you work through this lesson, aim to relate the new chord shapes and patterns to songs and pieces you already know. Strumming along with your favourite tunes will help you learn these chord shapes in a practical and musical way. I have included suggestions of songs you can play along to throughout the chapter. If you want to learn how to tune to DADGAD before attempting these chords, check out this lesson. Example 1 is a one finger chord shape. This D5 chord shape demonstrates the ringing quality of DADGAD and can be used to replace either a D major or D minor chord. The next example is an open G chord with a ‘D’ as the bass note. As well as strumming the chord once and picking through each note, aim to add a simple strumming pattern to each of the chords you are learning. The next open chord is an open A5 shape. This chord can be used to replace an A major or A minor shape. Example 4 puts the D5, G and A5 chord shapes together in a neat two-bar strumming pattern. Now that you have learnt D5, G and A, here are a few songs you can strum along to using just those chords. Some of these songs may use a variety of chord shapes but for now just use the simple shapes you have learnt. As DADGAD favours chords in the key of D, it is important to learn a variety of chord voicings that suit this tuning. This example shows two different shapes of D major. By combining strumming and picking with some beautiful open chord voicings, we can create interesting sounding rhythm guitar parts. Example 7 introduces the chord of D minor in two different shapes. The darker, sadder tones of minor chords played in DADGAD tuning are a personal favourite. As you go through this lesson, I recommend highlighting your preferred shapes, that way you can concentrate on really ‘nailing’ those chords and have them ready for future reference. Example 1h uses the same rhythmic template laid out in example 1f but includes the D minor chord voicings instead of the D major shapes. Here are two more useful open DADGAD tuning chord voicings to learn, C major and A minor. In example 10 I created a picked arpeggio pattern around the C major and A minor chord shapes. Example 11 adds in the note of ‘E’ on the thinnest string to create a fuller sounding C major chord voicing. Here in example 1l, I have created a simple yet effective rhythmic pattern. The addition of the strummed mute, notated as X’s adds a percussive element to this chord sequence. Don’t worry if the C major and A minor shapes still feel a little more uncomfortable than the D minor; that is because they are four finger shapes and require a bit more practice. Example 13 demonstrates one of the most powerful techniques you can use with DADGAD chord shapes. By moving a power chord shape on the lower strings and having the higher strings open and ringing, we can create different chords. Here I have shown four of the most common places you can apply the shape, but please feel free to experiment with other frets and see how they sound. You can either barre the notes with one finger, or you can use different fingers to fret each note. I use a first finger barre to create these mini chords as it is easier to move around than separate fingers. In the next example, I combined an open D major voicing with the G and A chord shapes seen in the previous example. Feel free to create your own strumming, picking or finger picking patterns with any of the chords seen in this chapter. Example 1o shows one of the most commonly used chord progressions in pop music. For an incredible video that demonstrates this, check out The Axis of Awesome’s video called 4 chords. Here are the same chords seen in the previous example but with a slightly different shape and sound. By picking each note individually, you can hear the sound of the chord and check to see if there are any muffled notes. D/F# simply means a D major chord with an F# as the bass note. This chord is a common passing chord and a very popular sound in this tuning. I created a piece I call ‘Picky’ that centres around the use of open chord shapes. All the chords used in this track will feel familiar to you as you have learnt them throughout this lesson. Watch in awe as Andy Mckee plays his DADGAD YouTube smash hit Drifting. 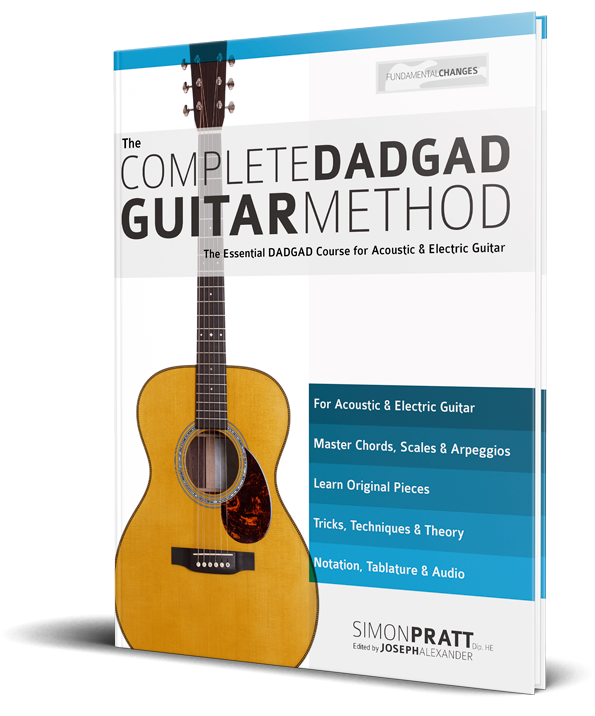 My new book, The Complete DADGAD Guitar method has just been released and is available now on Amazon.